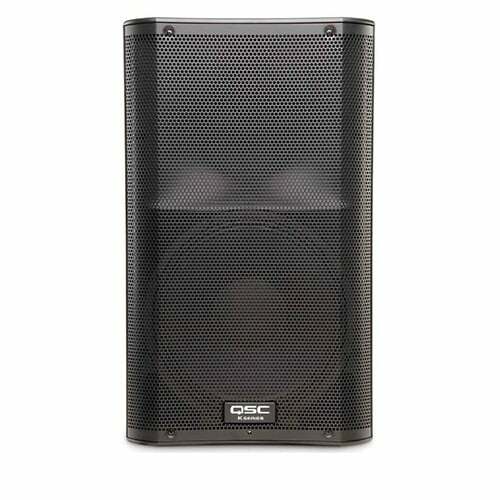 The QSC K Series is quite simply the new standard in lightweight powered loudspeaker systems. Under the direction of Pat Quilter, QSC’s team of amplifier engineers have created a new standard in Class D power modules unparalleled in the industry. Next, breaking from the traditional loudspeaker paradigm, all full-range models (K8, K10, K12) are fitted with the identical 1.75′ HF device for unparalleled performance, regardless of speaker size. Extensive DSP processing is employed throughout, providing levels of sonic clarity and total output that defy the system’s size and weight. Premium-grade materials, advanced construction processes and multiple mounting and suspension options allow for a wide range of live and installed applications. Combo XLR and 1/4′ TRS inputs accept both Mic and Line Level input while a set of RCA phono inputs (except KSub) allow additional connectivity to portable MP3 players, CD players and line-level mixers. Up to three audio sources can be mixed internally and summed to a balanced output for ‘daisy-chaining’ of multiple units. Separate direct outputs are also provided on each channel for additional output flexibility. On-board switches provide preset EQ settings. The HF setting (full-range models) can be set to VOCAL BOOST for additional presence in the critical mid-frequency area or FLAT for accurate reproduction of the incoming signal. The LF switch can be set to NORM, DEEP for additional bass extension, or EXT SUB (full range models) for use with an external subwoofer. The rear panel LED switch can be set to POWER, illuminating the front-mounted LED when the unit is powered on, OFF for applications where it is not desirable to illuminate the front LED, or LIMIT which indicates to the system operator that the clip limiter circuit has been engaged during operation. DMT (Directivity Matched Transition) provides for matched LF and HF coverage across the entire listening area, eliminating unnatural ‘dead’ or ‘hot’ frequency zones. Intrinsic Correction, first featured in our high-end line-array products, maps 65-75 spatially-averaged measurements to IIR and FIR filters that actively adjust time, frequency and amplitude response to a maximally flat band pass target. The result is a speaker that behaves equally well across the entire sound field. DEEP and excursion limiting allow for extended low-frequency response by actively managing low-frequency transients without degradation of the underlying signal or adjacent frequencies. Finally, GuardRail protection, the same technology introduced on the GX Series amplifiers, protects both the amplifier module and your performance from unnatural and destructive clipping. K Series full-range models are housed in rugged yet light ABS enclosures with a professional appearance that is at home in any application. ABS is a far more robust material than conventional speaker plastics and offers an additional measure of sonic clarity due to its internal rigidity. Ergonomic aluminum handles and a highly protective steel grille complete the package for ease of transport and long term durability. See our comparison chart to find out which K Series Loudspeaker fits your needs.